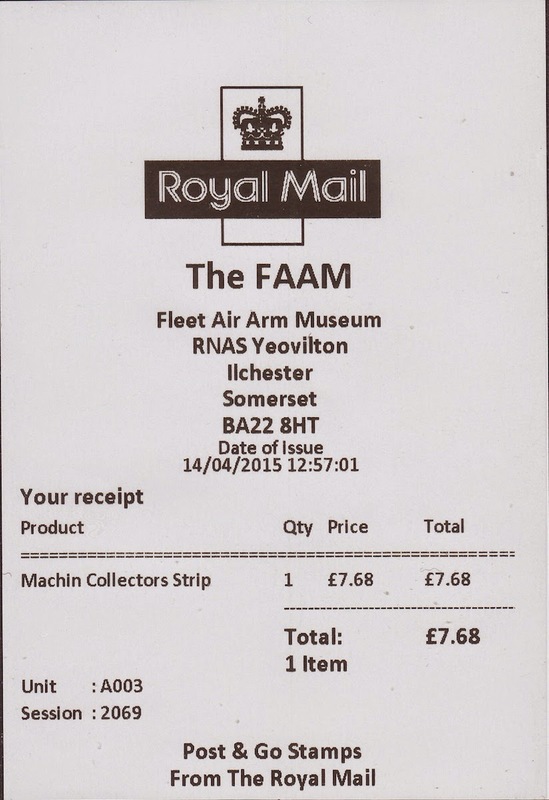 Royal Mail's latest venture into military museums didn't go entirely to plan as the machines did not produce the Fleet Air Arm Museum Harrier logo due to 'quality issues'. Perhaps it was copied from their website - it doesn't enlarge well from there. 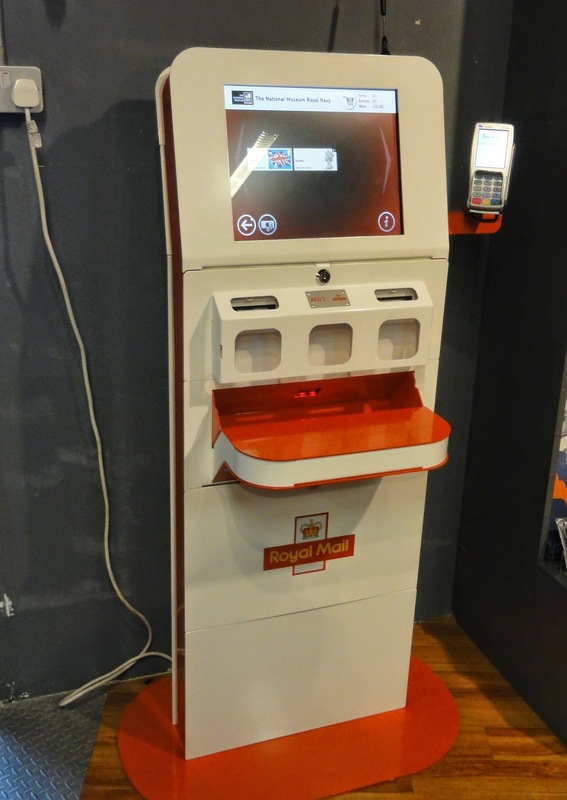 The machine was operational from 12.30pm on 14 April 2015 after set-up problems. 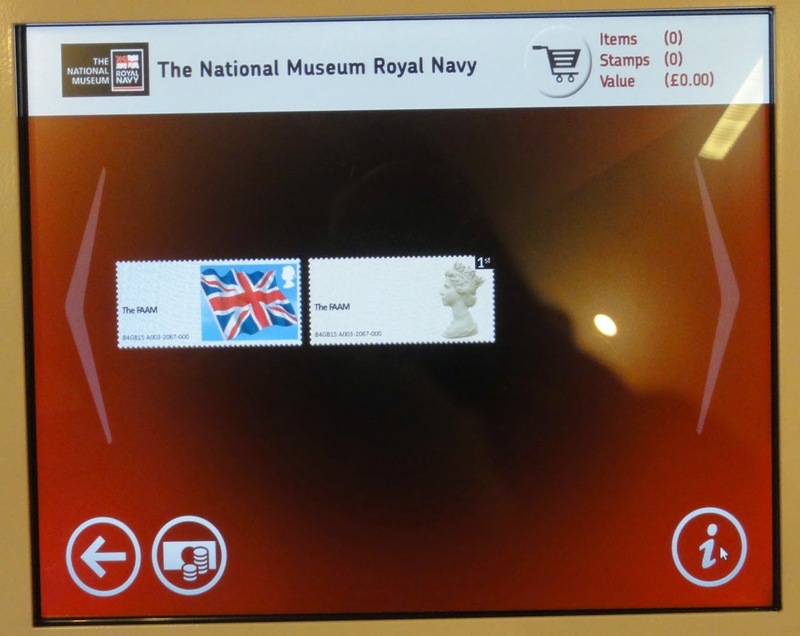 Thanks to several readers for pictures of the stamps and receipts, and photographs of the machine. Nobody mentioned year codes; as far as I can see the Machin is MA13 and the flag undated. Thanks to Trevor, Malcolm, and Roy. 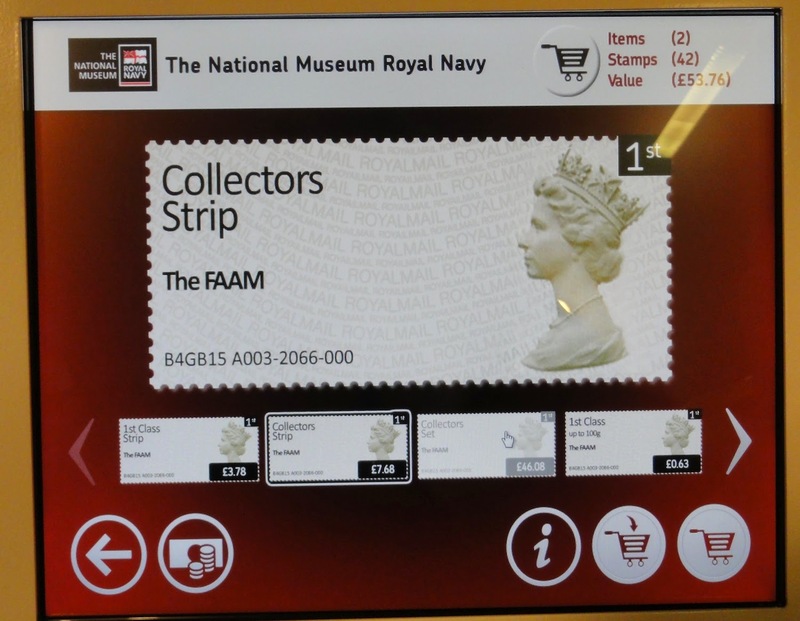 I wonder if the rebranding of the four museums will see the respective logos added to the P&G stamps. Larger versions of the logos are on the appropriate museums Facebook pages. 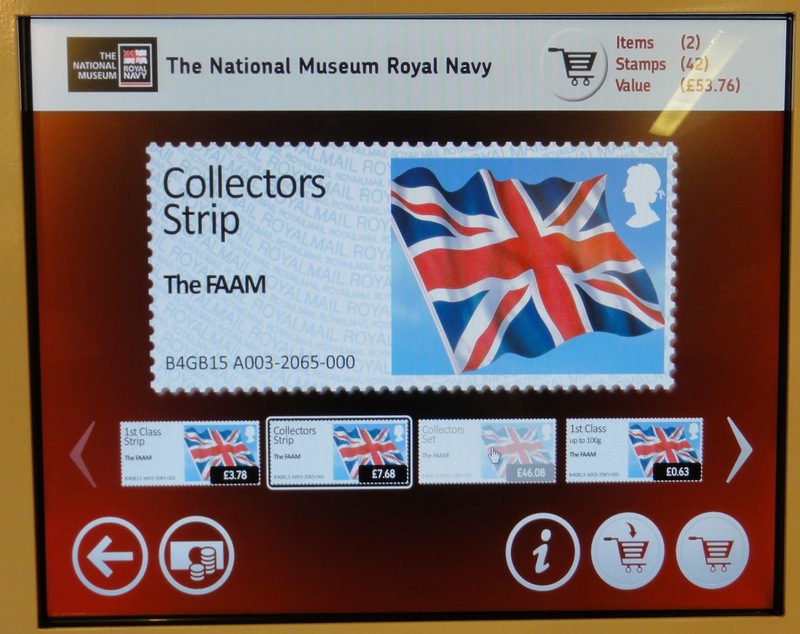 Will A004 be going to the Royal Submarine Museum? I often see old red pillar boxes in gardens along with old telephone boxes. I wonder if an old Wincor machine would enhance my shrubbery? It seems to fear (or greed) has taken over as the Penny Black Anniversary Smilers Sheet has disappeared from the Royal Mail's online store - less than a week after it was available for sale and still almost two weeks before its official release. Why don't they just produce enough??? 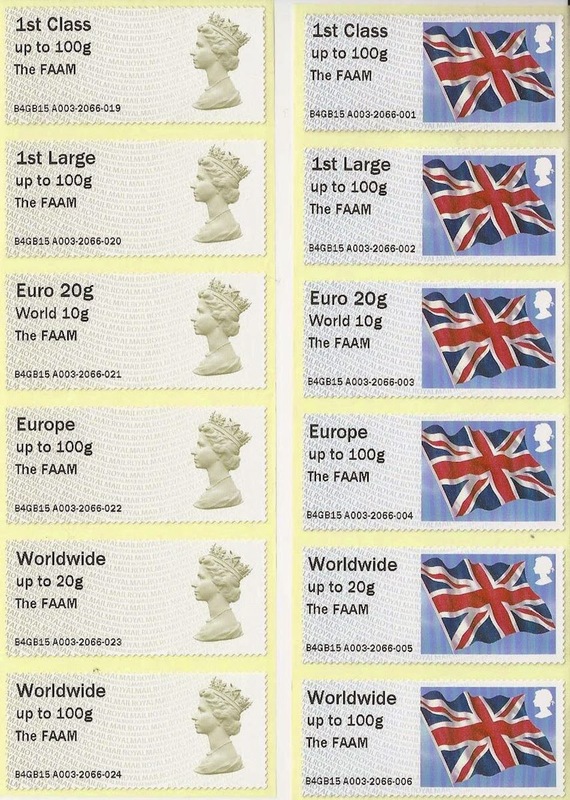 They are making a huge a profit with these as very few (if any) are being used for mailing. Personally I couldn't care less about the year codes any more. They're just used at random and as far as I'm concerned are totally meaningless!